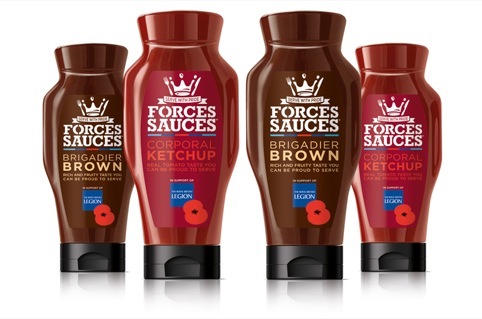 Blue Marlin has created the branding and packaging for Forces Sauces, a table sauce range that raises funds for charities Stoll and The Royal British Legion. Both charities work to support vulnerable and disabled current and ex-servicemen and women across the UK. Forces Sauces will initially launch with two flavours – Corporal Ketchup and Brigadier Brown – with six pence from each bottle sold donated to the two charities. Blue Marlin created a ‘soldiering’ structure for the sauce bottles, complemented with military-style graphics to highlight the brand’s charity credentials. The colour palette reflects the colours of the three arms of the British Armed Forces. The brand was founded by ex-serviceman Bob Barrett, who was provided with accommodation and support by Stoll in 2004 when he was diagnosed with cancer. As well as creating the structural packaging designs, Blue Marlin worked on copywriting and tone of voice for the launch of the range, which launches this month.